In Gilbert and Sullivan’s (probably mercifully) under-performed final collaboration The Grand Duke, a group of political degenerates try and bring down the government of a second-rate European power by means of a sausage roll. It is as ridiculous as it sounds – the most Gilbertian of Gilbert’s plots – as one complex and convoluted contrivance follows another. Yet, as ever, truth in the second decade of the 21st century seems to be more than capable of making fiction, even Gilbert and Sullivan, look accessibly pedestrian. Twitter, the great online masked ball where the ostracised troll and the respected public figure dances a dangerous pas-de-deux, with the one frequently taking the other’s place, is currently indulging in frenetic-type activity about the introduction of a vegan sausage roll by the High Street pastry giant Greggs. Everyone is playing to type – if you want to see them all, from the genuinely outraged to those outraged that other people are outraged, via, of course, the hordes of the performatively ‘disinterested’, then do go to the Greggs account. Their vegan sausage roll tweet has sparked articles in the Guardian, the Daily Express, and Cosmopolitan. Piers Morgan has also, regrettably, clearly not made a New Year’s resolution to keep his brain-burps to himself and has also waded in. One only awaits an editorial linking it to Cardinal Burke from The Tablet or an attempt to blame its presence on the Duchess of Sussex on the letters page of Majesty magazine to complete the full set of takes. To take us back to Gilbert and Sullivan, if the Kremlin had wanted to find a way of testing the theory that the British commentariat, arguably, indeed, much of the nation they supposedly speak for, has, from top to bottom, gone completely insane, it could have done worse than igniting a culture war over a baked snack. Insane though the takes are, the storm of bad opinions is, of course, the point. Greggs are not stupid. They are, after all, in a business that seems unlikely ever not to have a market in this country. As the last cockroach-human hybrid makes its way from the charred remains of what was once Britain across the scorched desert where the Channel once was, he will, indubitably, stop for a steak-bake before leaving the post apocalyptic wasteland for good. The furore will, undoubtedly, result in more people buying a vegan sausage roll than would have done so before. I sincerely doubt that Greggs were relying on Dr Gillian McKeith marching into the Morningside branch and ordering 40,000 of the things this morning. But, as Brits crawl back to work in January after their festivities, the half-remembered sight of Piers Morgan, puce with fury on ‘Good Morning Britain’, might lurch into their subconscious and tempt them to test and taste what all the fuss is about. 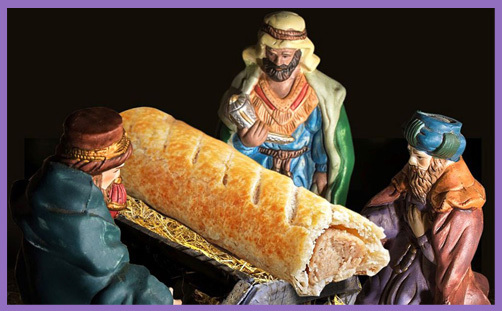 Of course, Greggs has form in this regard: in Advent 2017, they provoked similar waves of anger, counter-anger, and carefully studied lack of interest when they produced a series of adverts where the figure of Jesus in a traditional Nativity set was replaced by a sausage roll (a non-Vegan one; perhaps suggesting that someone in the marketing team takes their Ave verum corpus seriously). Of course, the scandal then died down in a couple of days, and now the Greggs Nativity joins the litany of other long-forgotten news stories as we, in the great goldfish bowl of social media, swim round the corner into the next story we can get angry about, or throw our weight behind, or sardonically ‘ignore’. Vegan sausage roll-gate will go the same way, of course. It will join the line with the other forgotten stories – the Gatwick drones, ‘I’m a Celeb’, the Paris Spiderman, the Copts, Grenfell, Syria – as we do another lap of the bowl in 2019. This fixation with the present seems to stretch across the political spectrum. In the culture wars, whether it be about sausage rolls or gender roles, both sides seem fixated on the right now. Conservatism in particular seems utterly unable to articulate a positive vision for the future or to draw convincingly on the structures of the past. Instead, it contents itself with moaning about what is bad in the present, fixating on what is wrong with the here and now (which, of course, makes it a circus mirror-image of liberal progressivism: ‘these structures are wrong’; ‘this trend is worrying’; ‘I wish things could just be like x’, are all gripes without set-party colouring). Another dangerously intertwined dance, though less a pas-de-deux and more a furious, gurning grind on one another at the edges of an increasingly emptying dance floor circa 3.00am. How, then, do we preach the real Nativity in a culture such as this? How can we speak of timelessness, of the ineffable, of the pre-existent and, indeed, of the post-existent when we’re constantly looking at the here and now, living, as we are so often encouraged, ‘in the moment’, only for the moment to slide away as we make the next turn around the bowl and we’re forced to contrive a new take, a new anger, a new type of sausage roll, round which we can anchor our transient identities? Therein, perhaps, lies the potential appeal of the real Nativity (and, as the statistics appear tentatively to show, it is still a part of the faith that has wide appeal). It’s a chance to ground one’s identity outside the goldfish-like life-spans of all other forms of existence. Even the formerly reliable forms of identity – politics, nation, group of nations, family etc. – prove to have fallen victim to transience, and are as of a oneness with the Greggs vegan sausage roll. The manger, however, opens the door to an identity rooted outside a world fixated by sausage rolls and the like, an identity outside the fragile figures that we call ourselves. That message is what makes the news of Bethlehem so difficult to sell in the age of present preoccupations, and yet it is also the only message that might just make us stop our frenzied journey round the goldfish bowl and look headlong into the eternal.